This course is open to CFAV’s from the ACF and CCF Army Section, bids are welcome from the ATC and SCC on a top up basis. The aim of the 10-day SL1 course is to assess the instructional skills required to deliver SF1 as DT. Assessment will take place on pisted ski slopes and off-piste terrain. 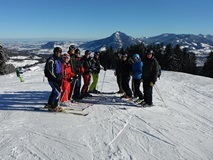 Remit – may ski independently within a recognised ski area within their own limits and ability, however individuals are strongly advised to remain in groups where possible. Remit – may deliver SF1 as DT within the confines of a ski area within a ratio of 1:8. This qualification is not time barred.